Jude 1:24-25 – Now to him who is able to keep you from stumbling and to present you blameless before the presence of his glory with great joy, 25 to the only God, our Savior, through Jesus Christ our Lord, be glory, majesty, dominion, and authority, before all time and now and forever. Amen. Whittleton Branch trailhead on KY-15. Red River Gorge Geological Area, Daniel Boone National Forest, Kentucky. My wife and I have come to depend on our hiking sticks. We were not sure we would like them at first, but now we very rarely hit the trail without them. 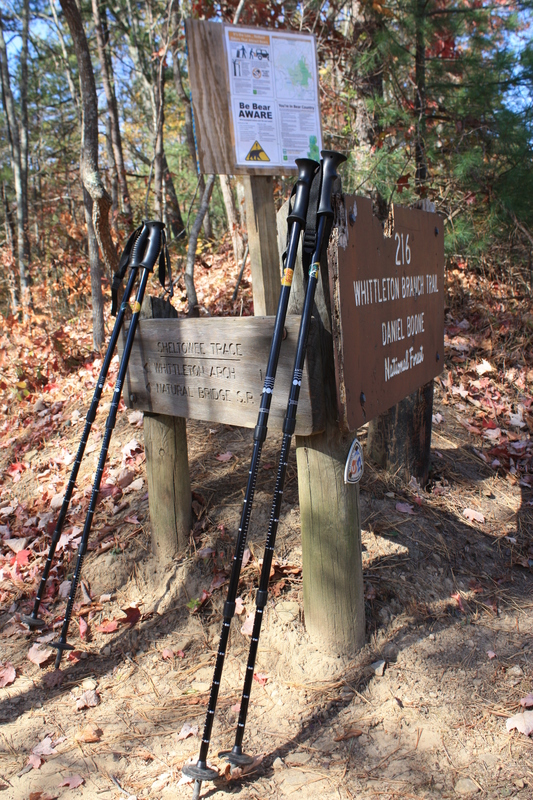 If you have never used hiking sticks you might be surprised at the difference they make in your endurance and ability. They reduce the strain on your hips, knees, and ankles and at the same time give you the added benefit of an upper body workout. On several occasions they have kept me from twisting an ankle on rugged terrain or slipping on a muddy trail. They also provide stability if you need to ford a stream. If you plan to do any serious hiking, I highly recommend getting a set of sticks! When it comes to our Christian walk we have one who is able to keep us from stumbling, as well, that is, of course, our Lord and Savior Jesus Christ. But unlike a set of hiking sticks, we cannot treat him like some optional piece of gear that we pick up one day and set aside the next as our feelings dictate. If we want to keep from stumbling we must put our trust in him daily, walking in faith with the knowledge that it is only through the power of his blood shed on the cross that we are able to overcome the desires of our sinful hearts. This entry was posted in God is Revealed... and tagged Assurance of salvation, Christ, Christianity, Daniel Boone National Forest, God, Gospel of John, Hiking sticks, Jesus, John 6, Jude, Kentucky, Perseverance, Perseverance of the saints, Red River Gorge, Red River Gorge Geological Area, Salvation, Slade Kentucky, Whittleton Branch by Todd D. Nystrom. Bookmark the permalink. Coincidence , I don’t think so. Our pastor has been preaching on John’s Gospel, yes, chapter 6 for the last three weeks. God’s blessings are in store for all who read and hear His Word. Glory be to Father, Son and Holy Spirit. Yep, definitely not coincidence, sovereignty!